The upcoming Regional Ring Road along with upgradation and widening of several roads under the Strategic Road Development Programme (SRDP) will play a vital role in enhancing road connectivity in the city and connecting major National Highways with each other. Providing a thrust to Hyderabad’s image as a global city, the government has sanctioned funds worth thousands of crores for projects that will not only address major traffic issues but will also strengthen road infrastructure of Hyderabad. While the foundation stone for some major projects including a flyover and widening of important roads have been laid, the state government has asked for a proposal from the authorities for other projects in the pipeline. Let us have a look at some of the ongoing projects and how they are going to make transportation easy in the city. In order to improve connectivity between Outer Ring Road (ORR) and RRR, the government has proposed 35 radial roads, of which, 19 have been completed. Construction work on five roads are in different stages of completion and work on the remaining 11 roads will commence soon. Once operational, it will primarily benefit the residents from the outskirts of the city who no longer have to travel to the city to get on the highways. As of now, a Detailed Project Report (DPR) of the project has been submitted to the Centre, which will be implemented under Build, Operate and Transfer (BOT) basis. Strategic Road Development Programme (SRDP): Road infrastructure in Hyderabad is expected to get a major facelift under the Strategic Road Development Programme (SRDP) which aims to augment road infrastructure thus, providing a smooth passage for vehicles. Under SRDP, the Greater Hyderabad Municipal Corporation (GHMC) have already constructed an underpass at Mind Space Junction while construction work for two flyovers at Biodiversity junction and one flyover at Rajiv Gandhi statue junction in Kukatpally is in different stages. These projects are being built at a combined cost of Rs 379 crore. Experts believe that the completion of the flyover at Rajiv Gandhi statue junction in Kukatpally will ease traffic movement from Malaysian Township to JNTU second gate. The flyover at Biodiversity junction will facilitate smooth traffic movement from Gachibowli towards Khajaguda thus ending the long traffic jams at the junction. Elevated expressway on NH-202: A 6.25-km long elevated expressway on NH-202 from Uppal is another vital project which is being undertaken at an estimated cost of Rs 627 crore. The expressway will allow highway traffic to avoid traffic jams at Uppal junction and on the stretch towards Boduppal. 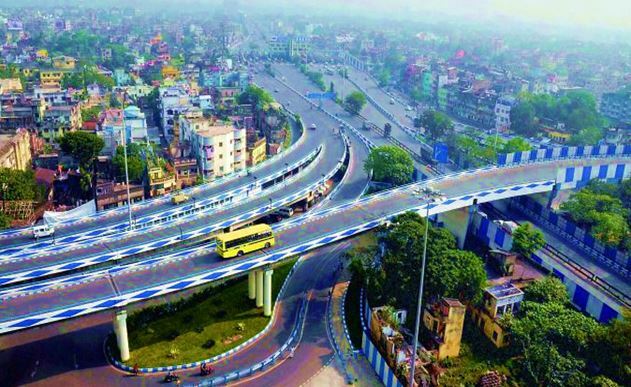 Amberpet Flyover: A flyover at Amberpet and ‘6 Number’ junction, which has been a long-pending demand in the city is finally inching towards reality. Being constructed at a cost of Rs 187 crore, this project on NH-202 will have a 1.5-km proposed flyover leaping over the junctions of 6 Number and Amberpet. Aramgarh-Shamshabad expressway: A semi-elevated expressway between Aramgarh and Shamshabad would be built on NH-44 which will allow commuters to reach the Rajiv Gandhi International Airport at Shamshabad faster. The current stretch narrows down at Shamshabad and a few other points leading to traffic jams and delays for commuters heading either towards the airport or Rayalaseema and Bangalore by road. Rehabilitation and upgradation of National Highway 765D: The widening of the NH-765D from Hyderabad-ORR to Medak junction extending up to 63 km is another important project that will include construction of paved shoulders on either side of the road. It is being constructed at a cost of Rs 427 crore.